While I was born in Tokyo I grew up in Minnesota. Even though my husband is a fishmonger and I love sashimi, I am a meat and potatoes girl. There is just something about a juicy hamburger and a side of fries or onion rings. Finding a good burger in Tokyo is getting better, but it’s not as great as one would expect. Thanks to food photos on Facebook I have been tracking down burgers around Tokyo that friends of mine approve of. Arms Burger is one restaurant that a friend recommends. He was at the main shop in Yoyogi. I visited the Arms Picnic shop in the B2 floor of Shinjuku’s Lumine Building #1. The location is convenient if you are traveling through Shinjuku station as it is a few minutes from the South exit. The shop, in the basement (B2) of Lumine, a department store at Shinjuku station. On this lunch day the small shop, with only 16 seats, was filled with nine girls, all dining solo, and a skinny salaryman. There are bags under the tables so that diners can store their shopping without putting it directly on the floor. A nice touch that should be exported overseas. The lunch menu has an avocado burger that comes with fries and a drink for 1,000 JPY. The burger was a bit on the skimpy side, but was good and 100% beef. That’s worth mentioning as many burgers in Japan are beef mixed with bread crumbs, egg, and other stuff that just doesn’t belong there. The serving of vegetables with the burger, it was so generous that I had to check and see if there was a hamburger hidden underneath it. It’s a messy burger to eat, which does remind me of America. The fries are great and the staff were accommodating to include some mayonnaise, a habit I picked up when I lived in Brussels. A nice burger that is conveniently located near Shinjuku Station. I will be back. 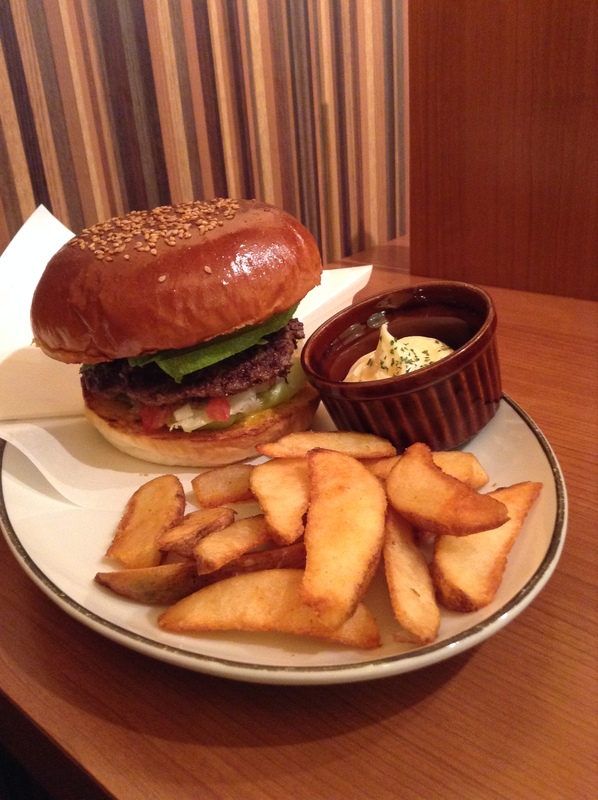 Hi Yukari – A fantastic burger joint is The Firehouse in Hongo 3-chome. Best burger and fries. More than helped over an occasional bout of homesickness. Arigato. The Firehouse has been on my radar for years but it is a neighborhood I just never get to. Hopefully someday! I just ate at The 3rd Burger this weekend. Really good in my opinion. The toppings were zesty and the burger itself, though messy, was very flavorful. Haven’t been to Arms though … another one for the list! Oooh, one can only hope! I did see they were in Ark Hills. I’ve actually heard that building is worth exploring, with some good food choices. Ah, two days in Tokyo is never long enough! Authentic Burger in Akasaka is my pick for best burger in Tokyo. 100% beef burgers, these guys know what they’re doing. The Broccoli Cheese and the Peach-eese Burgers sounds weird but are awesome.